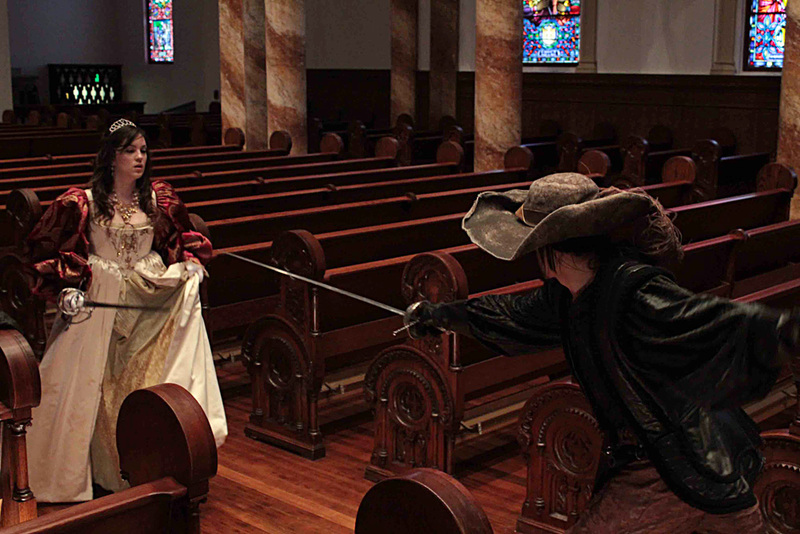 Although we had been rehearsing six sword fights for weeks for the student thesis film, "Three Swords and a Wedding," we left two fights out because the actors were unavailable; the manner in which they were to be dispatched kept changing; and the cast and crew seemed to think being killed was easy. That's true, if you know what you are doing. The problem is: We all think that we know what we are doing until reality proves us wrong. I had Albert (again a pseudonym, as are all the names in this piece) try extending his sword, then lunging at the hero. Fine, he could do that, but being disarmed was not working so, after three attempts, I replaced him with Carlos, one of my students from last year. Carlos gave the death choreography a try: extend, lunge, be bound over and up, release sword, be killed, fall in the church pew and die: seven moves. I gave Mark a three move "fight phrase:" extend, lunge and die. That he seemed to be the limit of his abilities. Time was growing short; we were loosing our light; director and crew were growing anxious to finish rehearsing and roll tape. When the student director called “Cut” and I went back over to the two young men just killed by the hero. I asked Carlos if he was okay. “No” he said, “My back is hurt.” Indeed, he was moving his back and shoulders in a weird way. I was alarmed and asked what caused it. He indicated the kneeler in the church pew he fell into. Mark was also bruised plus he didn't know how to loose his sword after being killed. Hence, it had sheered off a small knob of hand carved oak that decorated the armrest of the pew, which was sure to anger the Church's pastor. This was distressing, since both of them had assured me that their martial arts background had prepared them for doing fight stunts safely. But my experience has often proved the opposite and today was no exception. Like many fight choreographers, I find martial artists had to be retrained for theatrical violence. Even Carlos who, the day before, had demonstrated his ability to perform a sit-fall (grabbing me from behind and stepping back, we easily dropped, in a combat pas de deux, to the ground) was now having trouble falling into a pew. Although choreographing the precise physical movements that add up to a fight scene come easy to me, I have had to remind myself that I could not expect others to be able to do this for themselves. So I was frustrated. Despite my previous experience and better judgment, I let these two young men perform falls without padding or instruction and now they were hurt. Listening to Carlos' description, I realized several things: first, he wasn’t applying what he had learned in stage combat class; second he was not spotting himself, looking were he was going; and, third, his desire to “act” well had overshadowed safe technique. Fortunately, the situation was easily remedied. I padded the kneeler in the pew and showed him how to sit-fall by simply stepping backward into the pew and sit on the bench while rolling to his side to avoid injuring his spine. A light came on in Carlos' eyes; he performed in the rest of the shoot with ease. This was the 14th or 15th indie film I had worked on in the past year. Why was I still making the mistake of believing that martial artists know what they are doing when it comes to cinematic violence? Hadn’t I seen enough fight scenes performed poorly (including my own) on YouTube, or on websites or in small theatre venues around town? Although the above noted bad fall resulted only in minor bruises and repairable property damage, such good fortune is not always the case, as an actor friend and her scene partner discovered in the worst way this past February. We live in an age where anyone with enough money to afford a Cannon DSL or an HVX-200 can start making movies. Add to this that generations of Hollywood stunt men and women have made film violence look easy and it is no wonder then that so many of us think that it can be performed without much preparation. Of the 15 indies I have worked on recently, less than half the directors brought me in as a stunt coordinator and fight choreographer in a timely fashion—i.e. with enough time to prep the actors for the facsimile of violence they were about to enact. Of course, those that did “hire” me (i.e. offer some token payment for my time or equipment) did have the foresight to know that they in fact needed a fight choreographer, even if they couldn’t afford one, and for this I applaud them. After all, we filmmakers and theatre artists have a duty—an important responsibility—to provide a SAFE environment for those we work with. We don't want every little production to go "Spiderman" on us. Hiring a qualified stunt coordinator/fight designer in a timely fashion is a critical step toward fulfilling this responsibility. Alas, many indie directors pride themselves on not “hiring” anyone, which can lead to tragedy. In February this year, I received a call from an actor colleague of mine. She had just spent the night at the hospital after a rehearsal had gone horribly wrong. The doctors' prognosis: Her acting partner had caused multiple fractures to her arm and shoulder while attempting to rehearse a “simple” struggle. 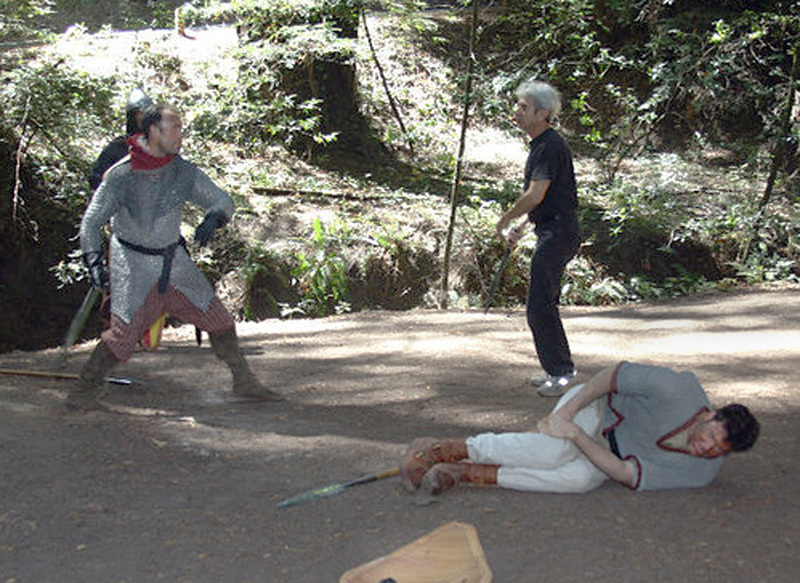 There was no fight designer present, none had been consulted, and no one knew enough about stage combat to prevent this injury. The result was a life altering: tens of thousands of dollars in medical and legal fees and months of recovery time. All of this could have been avoided for as little as $150, the minimum for three hours of a fight designer's time—and I’m sure that there are qualified choreographers who would have helped for less. It seemed simple enough. Liz (again not her real name) was to approach the man, raise her arms as though to beat his chest, and he was to grab her, turn her around and hold her. My friend stands around 5’6” and weights about 115 lbs., while her acting partner in the problematic scene, part of a new play being rehearsed for a local acting school’s theatre company, is about 6’2” and perhaps 190 lbs. Although it was eight days until opening, they had never got beyond the grab and the accident occurred the first time they rehearsed the scene. The man, let’s call him Sam, grabbed her forearms, forced them behind her back and twisted. Everyone in the room could hear bones snapping. In 2006, Gabrielle Carteris, of "90210" fame, was also injured in a life-altering way while making a TV movie. Carteris is 5’1”, her partner 6’6”, and again the scene was not rehearsed properly. She was repeatedly pulled upwards by her chin and then dragged down some stairs. She is still trying to recover from the nerve damage. We can assume that there was a stunt coordinator on the set but failed to do their job. In the case of both Carteris and my friend Liz, we see an egregious violation of the most basic principle of theatrical violence (albeit not the only one): The “‘victim’ does the work.” For example, someone being punched in the face snaps their own head back. Frankly, with so many qualified fight designers and stunt coordinators in the Bay Area, to say nothing of Los Angeles, there is no excuse for film or stage violence to go wrong. Since there is rarely any professional (Screen Actors Guild) stunt men and women involved in indie films, more time should be set aside for training and preparation. Not only will your hospital bills be less but filming will go a lot smoother. In addition, a qualified and/or experienced fight designer/stunt coordinator should be involved early on to at least advise the actors and crew regarding manifold ancillary aspects of film gags and theatrical violence. In the Bay Area, we are blessed with the Reel Directory and Propville, both great resources for action choreographers, as well as Dueling Arts San Francisco and fight directors certified by the Society of American Fight Directors. It is really not difficult to find a qualified action choreographer to help keep your film set safe. So, before you pick up your camera and rush off to the set or shoot, ask yourself: Do you have a qualified action choreographer who has trained and prepped your actors for at least one hour for every five seconds of fight time? The next time an actor or budding stunt person tells you that they have a black belt in karate or jujitso, still make sure that they retrain with a fight choreographer. I sure will. 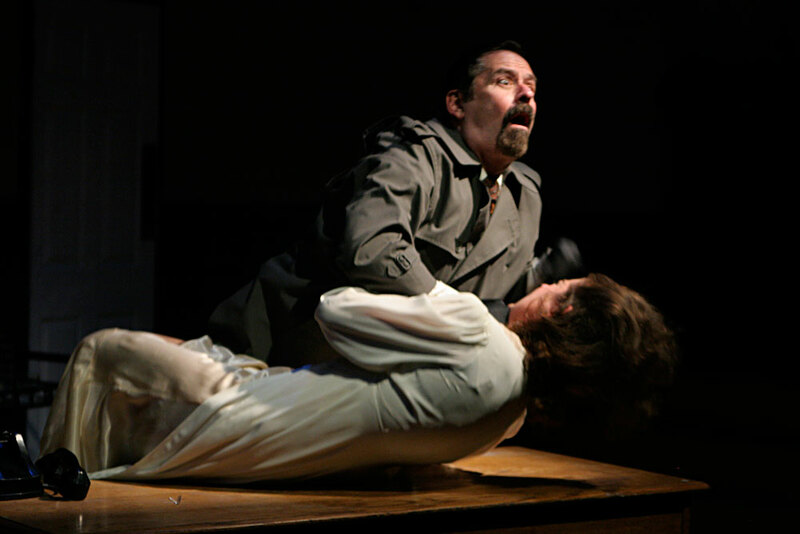 Durand Garcia is an actor, director and Fight Action Choreographer, certified with Dueling Arts International. He has appeared in over fifty plays and films; he recently directed Pinter’s "The Dumb Waiter" for the Off Broadway West Theatre Company; and he has choreographed over a hundred acts of violence or comedic mayhem including, of late, the indie shorts “Three Swords and Wedding” and “The King of England.” He teaches Stage Combat the Academy of Art University and is completing his Master of Arts in Drama at SFSU.